While the news in December 2017 is all about Disney buying over 21st Century Fox, this does not impact the 20th Century Fox World Theme Park Malaysia opening in any way. 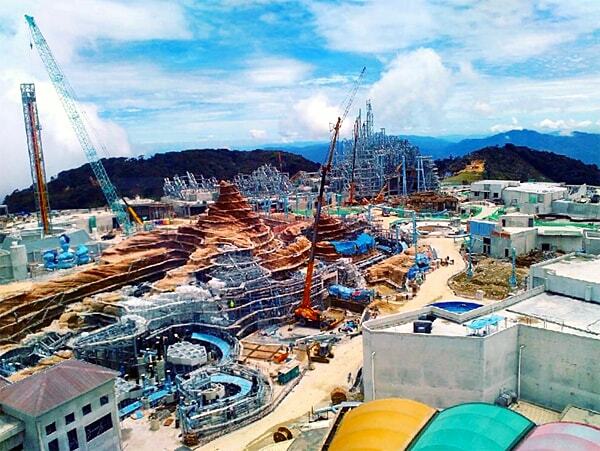 Construction is still on going and the big question is when will the nee Genting theme park open? In previous press releases earlier this year, the group has stated that the new 20th Century Fox World Theme Park in Malaysia will open somewhere in early 2018. 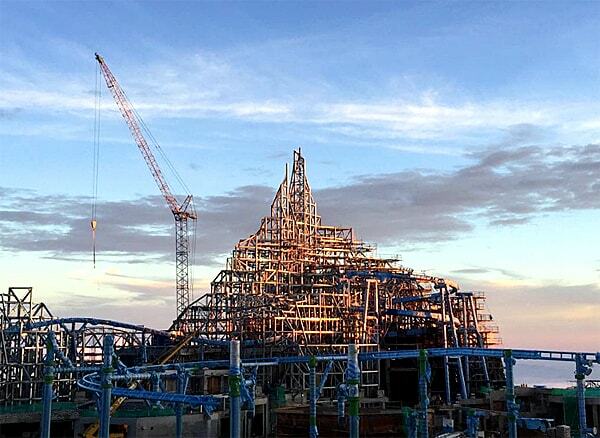 According to visitors who have recently been there, construction is around 60% and far from being ready. The main image above is from Rookie Drone who beautifully captured Genting Highlands from a drone photograph. With this comes a lot of speculation on the actual opening date of the new 20th Century Fox World theme park here in Malaysia. There has been no official press statements done in a very long time by the developers and owners. The last big hype was stated by mainstream news portals and papers in Malaysia where it was mentioned that the official opening in 2017 was pushed to early 2018. Many were hoping that the new theme park would open before or during the 2018 Chinese New Year period. One of the watchdogs that have been keeping updates through their forums is ThemeParx who has been posting latest of photos from people who recently visited Genting Highlands. However, even they do not have any solid answers on the opening. 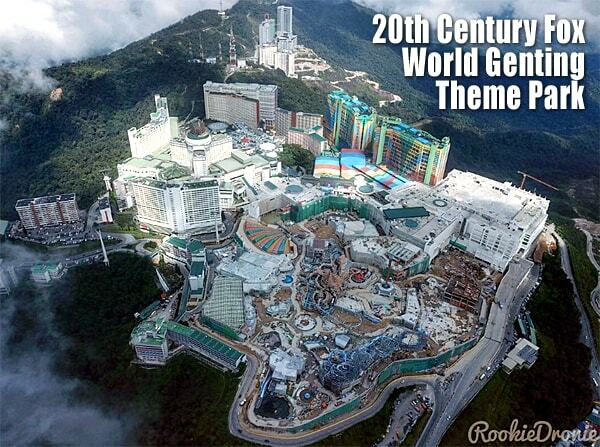 When is the 20th Century Fox World Theme Park Malaysia Opening? Since there has been no official announcement made, I am also joining in the speculation race that it will be late in 2018 or perhaps even in early 2019. Judging from the construction seen in recent photos for December 2017, the site looks like it is only 60% completed. There is still a lot of work needed to be done, which looks like it will not be ready for the early 2018 opening. The overall construction is massive as you can see from the main photo above. Those visiting Genting Highlands using the new Awana Skyway gondola cable car will have the opportunity to see the ongoing construction. This can be seen just before reaching the end. Resorts World Genting casino resort – also known as Genting Highlands – is currently undergoing an extensive revamp.The project – dubbed the Genting Integrated Tourism Plan (GITP) – was launched in December 2013. It is a multi-phase initiative described as a 10-year, MYR10-billion (US$2.45-billion) master plan. The Malaysian property has already opened several new facilities and attractions. There will also be progressive openings for new mall and for new casino areas. Genting Malaysia said last month it was “looking forward to the roll out” of a 20th Century Fox World Theme Park at Resorts World Genting, as well as to the opening of a new indoor theme park in 2018, as part of the GITP. The hottest business news in December 2017 is that the Disney Group has bought 21st Century Fox for a whopping USD$52.4 billion. This however, does not directly affect the 20th Century Fox Theme Parks and no, it is not going to be renamed to Disney Malaysia Theme Park. You should also know that there are some Malaysian bloggers who may toy around with this idea, just to get people to click on their links. Some bloggers even go to the extent in copying or re-writing articles that I cover on tourism news, which is quite sad. As mentioned, there is no official statement being released and everything now is just plain speculation. One contributor stated that the 20th Century Fox World Theme Park will only open its doors to the public once 80%-90% is confirmed completed. The most common question being asked by general consumers is when is the Genting new theme park opening? Seems like no one can answer this question for now until Genting Berhad makes an official announcement. As for the developers and owners, it is a smart move that they have not made any official announcement previously as it would have been a hot in the food and bad publicity. Especially if they kept on postponing the opening. For the lifestyle travelers, you should also take note that Southeast Asia's top club Zouk is opening in Genting Highlands at the Sky Avenue Mall in 2018. This will be the highest club in Malaysia at 6000 feet above sea level. For those planning to visit the new Genting theme park, you will most likely arrive in KL city before continuing your journey to Genting. While in the city, there are many options for accommodations, and for budget accommodations in Kuala Lumpurr, there are plenty to choose from. While all this is happening, we can patiently wait for news on the 20th Century Fox World Theme Park Malaysia opening. Till then, you can also look forward to the new world class Desaru Coast project which is scheduled to open somewhere in 2018.